Israel may be painting a victorious picture of the war in Gaza, but 50 days of fighting looks set to cost it dearly on the political, economic and diplomatic fronts. Under attack by hawks in his cabinet for accepting a ceasefire which ended the violence on Tuesday, Israeli Prime Minister Benjamin Netanyahu has seen his popularity plummet as the military operation, which began on July 8, dragged on for seven weeks. But on Wednesday, Netanyahu presented his defense: Hamas, he said, was hit “very hard” and did not receive anything it had demanded in exchange for halting its fire, namely a port and an airport in Gaza. Such matters are to be discussed, along with Israel’s demand for Gaza militants to disarm, at a new round of talks which will take place in Cairo within the coming month. But already, Israel has begun staking out its position – that there will be no port, nor an airport and no entry of any building materials that could be used by militants to manufacture rockets or build tunnels or other fortifications. On the military front, Netanyahu also outlined Israel’s achievements – the destruction of a network of attack tunnels and the elimination of “approximately 1,000 terrorists,” among them senior military commanders. He also listed the performance of the Iron Dome anti-missile system, which shot down 735 rockets heading for populated areas, which the army said equated to a 90 percent success rate. Throughout the war, 70 people were killed on the Israeli side, 64 of them soldiers. Of the civilians who died, all of them were killed by short-range mortar shells which struck close to the border within a range that Iron Dome cannot intercept. “A small military victory but not one that is strategic,” said Mark Heller, research fellow at the Institute for National Security Studies at Tel Aviv University. As far as Hamas is concerned, “its only success was to have managed to survive,” he said. But on the ground, Hamas has chalked up a number of points. During the fighting, 64 Israeli soldiers were killed in what was the army’s heaviest losses since the 2006 war with Lebanon’s Hezbollah. 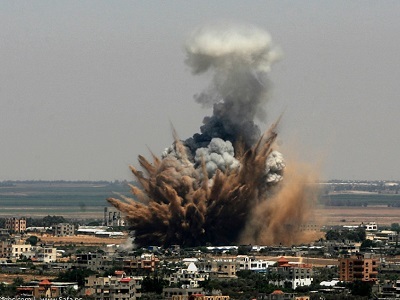 And despite Israel’s intensive bombardment which created death and destruction across the Gaza Strip, costing the lives of 2,143 Palestinians, Hamas continued firing rockets up to the last minute before Tuesday’s truce went into effect. Throughout the seven-week conflict, militants in Gaza fired 4,591 rockets and mortar shells at Israel, of which 3,650 hit Israel and another 735 of which were shot down. The bombardment regularly set air raid sirens wailing across southern and central Israel, sending millions scrambling for cover in cities as far away as Tel Aviv and on several occasions in Jerusalem. And the intensity of the fire also turned the communities near the Gaza border into ghost towns, with thousands fleeing with their families to seek shelter in other parts of the country. But none of this has translated into political gains, said Eyal Zisser of the Israeli Moshe Dayan Institute. “Politically, Hamas has not achieved anything and there is very little chance it will get what it wants in terms of the construction of a port or an airport in Gaza,” he told AFP. The financial cost of the operation in the third and longest Gaza war in six years is estimated at around three to four billion dollars, experts say. Israel’s defense ministry has demanded a grant for a similar sum to restock on ammunition, including for its Iron Dome defense system. If it gives into the financial demands of a powerful military lobby, the government could be forced to cut budgets elsewhere and increase taxes, bringing socio-economic pressure on itself. On the diplomatic front, Israel’s offensive has put already tested relations with key ally the United States under severe strain. Harsh criticism from Israeli officials of top US diplomat John Kerry’s attempts to broker a truce prompted a strong rebuke from the Americans, as the State Department condemned the killing of innocent civilians in incidents the UN attributed to Israeli bombardments. Meanwhile, some 50 percent of Israelis said they were satisfied with the way Netanyahu carried out the operation, a drop from 77 percent just three weeks earlier, a poll showed.